The world knows him as Mark Twain, the perpetually quotable writer of such classic American novels as The Adventures of Huckleberry Finn and Tom Sawyer. But some people don't know that Samuel Clemens was the name he was born with — or that he published the Personal Memoirs of Ulysses S. Grant, one of the most popular books of the 19th century. Born in Florida, Missouri, in 1835, Samuel Clemens moved to Hannibal, Missouri, a Mississippi River town, when he was four. When Samuel was 11, his father died, and the boy went to work to help support his family. At 13, he began working as a printer's apprentice for his brother Orion, who published a newspaper in Hannibal. As a young man, Clemens worked as a printer in a number of towns and cities, including New York, Philadelphia, and St. Louis. For years, Samuel had written short, funny stories and tall tales about life in America. He had even published a few. But about 1857, on a trip down the Mississippi, he abandoned his writing to pursue a lifelong dream — becoming a riverboat pilot. After 18 months of hard work, he earned his pilot's license. Altogether, Twain spent four years steaming up and down the Mississippi. 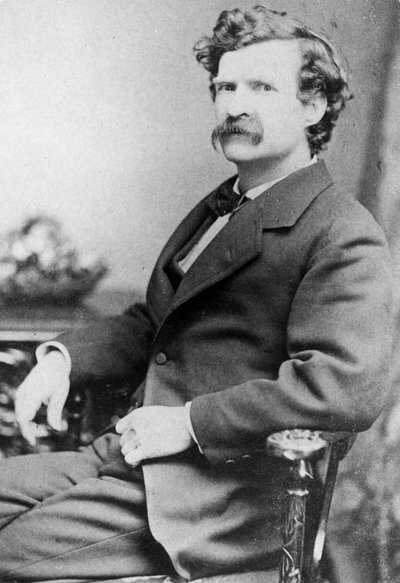 When the Civil War broke out, Twain spent a few weeks in the Confederate army before resigning and heading to Nevada, where his brother Orion had been appointed territorial secretary. While there, Clemens began to write again -- and adopted the pen name "Mark Twain." A term used in river navigation, "mark twain" means water that is two fathoms (or about 12 feet) deep. Twain's experiences in the first three decades of his life became fodder for the stories he would later write. One famous Civil War-era incident, which Twain later recounted in Roughing It, immortalized a container of common flour as the National Sanitary Flour Sack. In 1864, a Nevada man named Reuel Gridley received a 50-pound sack of flour as payment for a wager, and decided to auction it off, with the proceeds going to the newly-formed United States Sanitary Commission, a forerunner of the Red Cross. The winner of the auction immediately put the flour up for auction again, and so did the next winner. The sack changed hands over and over, and traveled from town to town, but remained on the auction block as Gridley raised the astonishing sum of $150,000 for wounded Union soldiers and sailors. As Twain would later describe it, the coincidence of flush times for Nevada prospectors and the growing need for charitable contributions for the war was a "happy thing." In the days of the Nevada mining boom, explained Twain, "money was wonderfully plenty. The trouble was, not how to get it, but how to spend it, how to lavish it, get rid of it, squander it." In 1865 Twain published "The Celebrated Jumping Frog of Calaveras County," a humorous tale that earned him national attention. He followed it with Innocents Abroad, his first best-selling book, in 1869. It told the story of a trip he'd taken to Europe and the Middle East. Twain married a woman named Olivia Langdon in 1870. At their home in Hartford, Connecticut, Twain wrote the novels that made him an American treasure. Among these were Roughing It (1872), Tom Sawyer (1876), and Huckleberry Finn (1884). The books sold well, but Twain struggled financially. A poor businessman, he invested much of his earnings in worthless inventions, and was often in debt. But his relationship with Ulysses S. Grant helped Twain bring in some desperately needed cash. Twain had heard a rumor that the ex-president and Civil War hero was interested in publishing his memoirs. He visited Grant and proposed a deal. If Grant would let Twain publish his memoirs, he would give Grant 75% of the profits. Like Twain, Grant suffered financial troubles. After some consideration, he agreed to let Twain do the job. Charles L. Webster & Company, a publisher co-owned by Twain and his niece's husband, published Grant's Memoirs in 1885, shortly after Grant's death. Twain sent salesmen all over the country to sell the work, which was offered as a two-volume set with a choice of three bindings. 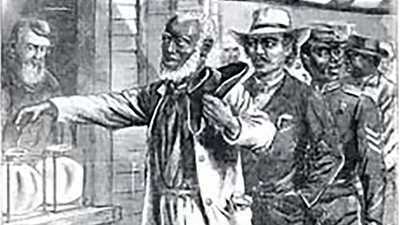 Many of the salesmen were Civil War veterans. They wore their army uniforms to create sympathy for Grant, who had died just days after finishing his manuscript. Twain appreciated Grant's writing, and he praised the Memoirs sincerely. 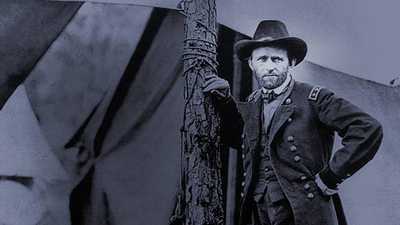 Of Grant he wrote, "this is the simple soldier, who, all untaught of the silken phrase-makers, linked words together with an art surpassing the art of the schools and put into them a something which will still bring to American ears, as long as America shall last, the roll of his vanished drums and the tread of his marching hosts." 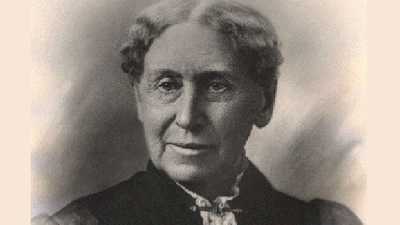 Grant's memoirs won critical acclaim, and about 300,000 sets were sold. His widow Julia received over $400,000 in royalties from the project. Twain made as much as $100,000, but continued to struggle. Webster & Company went bankrupt. Twain was forced to write and lecture to pay off his debts, which he finally succeeded in doing. The deaths of his wife and two daughters contributed to the deep sadness that Twain experienced in his later years. He died in Redding, Connecticut, in 1910, with his autobiography unfinished.